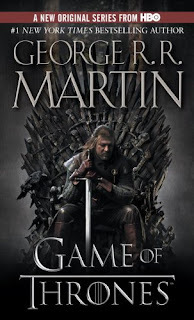 Steph's Stacks: Review: "Game of Thrones: A Song of Ice and Fire: Book One"
Review: "Game of Thrones: A Song of Ice and Fire: Book One"
Watch out, Ned. That chair's a killer! You might as well find this out about me now: I'm a sucker for movies or TV shows inspired by books. My personal rule is I have to read the book before I can watch the adaptation. I can be pretty harsh about not-so-great interpretations (I'm talking to you, Divine Secrets of the Ya-Ya Sisterhood movie)﻿, particularly from books I love. However, when it's done well, I'm in book/movie geek heaven! 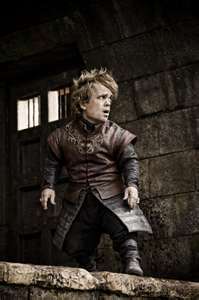 Enter the first of my many favorites: Game of Thrones. You may have heard about this year's HBO adaptation of the first book of George R. R. Martin's A Song of Ice and Fire series. The mini-series was amazing, but the book is even better. Here's the lowdown for the uninitiated. At the center of the conflict lie the Starks of Winterfell, a family as harsh and unyielding as the land they were born to. Sweeping from a land of brutal cold to a distant summertime kingdom of epicurean plenty, here is a tale of lords and ladies, soldiers and sorcerers, assassins and bastards, who come together in a time of grim omens. 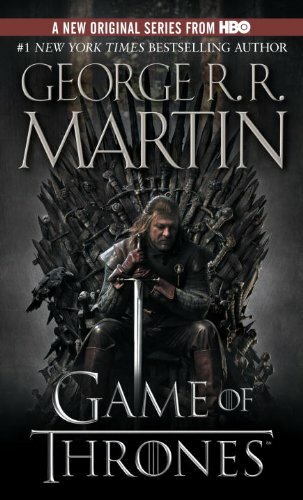 Amid plots and counter plots, tragedy and betrayal, victory and terror, the fate of the Starks, their allies, and their enemies hangs perilously in the balance, as each endeavors to win that deadliest of conflicts: the game of thrones. Great for fans of: The Lord of the Rings, Pillars of the Earth and books with maps and appendices. The size of the book may scare some, but Martin employs a wonderful technique where each chapter is from the point of view of a different character (of which there are plenty, I assure you...) and consequently, you forget how long the book is (actually, I promise, you will be wanting more at the end and you're in luck, friend...). The action is swift and brutal. 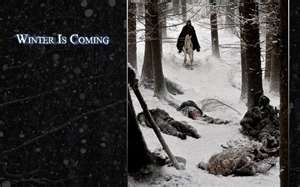 "Winter is coming..." and you had better be prepared for the turns and twists around every corner. I'M READY FOR A GOOD FANTASY READ. YOU MAKE ME WANT TO RUN OUT AND GET THIS ONE.